Villa Virginia Positano is a luxurious villa in the heart of Positano. It used to be the home of Aldo De Benedetti, a famous playwright. Perched over the sea, it has access to Fornillo beach. Exclusive, magical and picturesque, Villa Virginia is perfect for intense relaxation and escape from the ordinary. Spread over 200 square meters, it can host up to 10 people in 5 beautiful bedrooms, each with private panoramic balcony and breathtaking views. On the first floor there is a large garden surrounded by 14 columns and equipped with tables and deckchairs, for guests only. Ideal location for unforgettable events. The large outdoor area is suitable for small and large receptions. On request a chef is available for private dinners: you will be able to taste typical local dishes prepared with delicious specialties produced exclusively at the villa. Inside the villa there are elegant and refined furnishings with ornamental handmade artisanal objects. All is set in a typical Mediterranean architecture with wide white vaults and majolica floors from Vietri sul Mare. The living room is no less: antique furniture and access from the dining room where there is a large fully equipped kitchen, perfect for a pleasant holiday. From the dining room area you can enter into the first double bedroom with private sea view balcony, private bathroom and all comforts. On the upper floor there is a marvelous suite bedroom, consisting in a double bedroom with sea view, a private bathroom and an elegant sitting room with access to the private balcony. From the back corridor you can access the remaining three double bedrooms, each with a sea view balcony and all comforts, such as air conditioning, satellite TV, Wi-Fi connection. 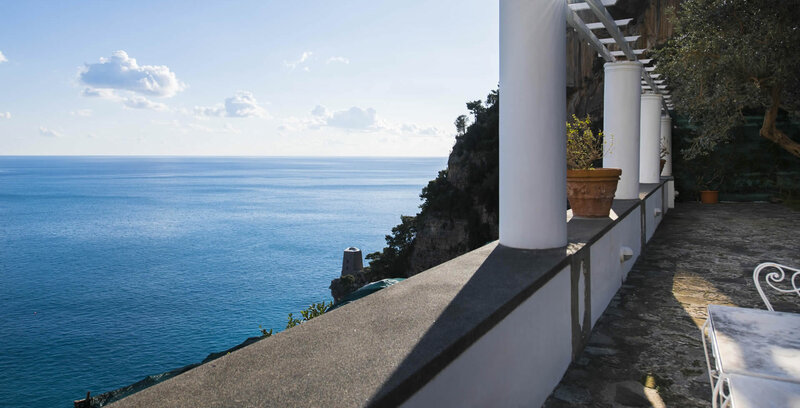 Villa Virginia Positano... a lovely place to be lulled by the echo of the sea and enchanting sunsets. True Mediterranean Experience. Live it.